A prolific poet, novelist, translator, crank and intellectual elitist, Slavitt is the antithetical politician, but that didn't stop him from entering the 2004 Massachusetts State Legislature race to run against a long-time Democratic incumbent in a predominantly Democratic district. It is a given that Slavitt will lose, but what keeps the narrative engaging is Slavitt's confrontation with the demeaning task of political pandering and his efforts at maintaining the ""likeable fellow"" veneer: he has to wear a fake smile, glad-hand and try to convey his message during hasty interactions with voters at innumerable community events. Slavitt, a former Yalie debater, enjoys taking the podium opposite his opponents, and it is his oratorical abilities and acerbic wit that endear him to newspaper editors and a small portion of the electorate. During his campaign, enough people accept his signs and promotional bookmarks that it is surprising when he loses in a landslide. (His 13 percent of the vote was ""catastrophic,"" he notes. ""There was a Socialist Workers' Party candidate who did better."") 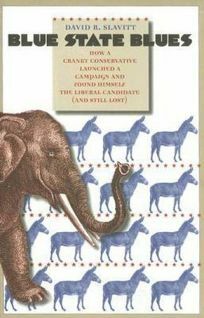 A discouraging look at the politics game as played by the ultimate outsider, Slavitt's book will appeal to the politically jaded.